You guys are in trouble now! I downloaded Picassa from Google and now I'm learning to make collages. I can impose even more of my photos on you this way! 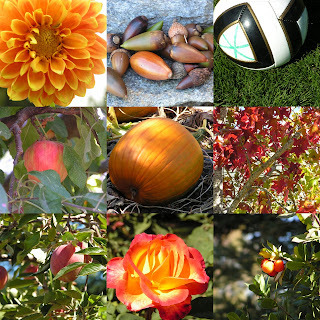 This collage is meant to signify Fall. As of this weekend, the season has officially changed on the calendar - but what makes Autumn feel like Autumn to you, and why? First of all- the word Autumn is very special to me. I grew up on Autumn Drive and was probably one of the first in my class to be able to spell that word. So truly the first thing that comes to mind when I hear the word Autumn is the street I grew up on. I had a wonderful upbringing and remember it fondly. As for the Autumn that comes to everyone else's mind - in California one season pretty much blends in to the next but this weekend I went around looking for signs of Fall. First of all - soccer is on every field every moment of every weekend day. This is probably the most prevalent indication of Fall. Now that I have 3 kids playing soccer it is also an indication that all of my weekends are occupied! There are also changing leaves on some trees, especially the Liquid Amber which can be truly beautiful. Then there are apples and pumpkins waiting to be picked. I love the Autumn and am looking forward to the cooler days and nights but that won't be for awhile yet. What do you like best about the Fall? Thanks for sharing about growing up! The collage is so cool! That's a great answer! Especially for someone from a state that doesn't reall have fall! I love the pics.